Transformative cuisine and a setting filled with exquisite art create blissful diners. : RESTAURANT GUY SAVOY HAS MOVED TO THE MONNAIE DE PARIS (11, QUAI DE CONTI) AS OF MAY 19, 2015. 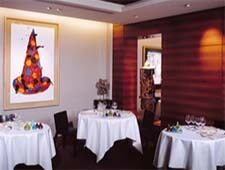 In his 21st century inn, Guy Savoy transforms traditional products into works of art, and to show his love of all forms of art, displays on the walls beautiful paintings of great contemporary artists and African sculptures. An evening here is an invitation to exercise all of your senses. The palate is captivated by the sublime tastes of dishes that reach perfection while the sight is fascinated by the masterpieces hanging in the room composing a rare decor. Opera singer Barbara Carlotti, with whom we shared dinner, found the right words to express this sensational (in the true meaning of the word) experience. For her, the tuna tartare with caviar is like a trace of bitterness on a silk scarf, and the artichoke soup evokes a nymph on the bank of a brook. The cube of sautéed foie gras compares to a big grey cat on a red velvet cushion. The blood orange sorbet with its fine slices of oranges sings like a joyous melody filled with sunshine and a spring caress. A cuisine that can conjure such pretty metaphors is worthy of the highest rating.